Stylish elevator boots, characterized by the upper in black brushed calfskin, hand-punched and by the innovative olive green track sole made of 100% natural rubber. 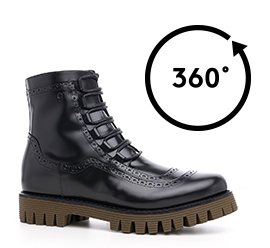 A boot that combines craftsmanship, refined lines and a modern and avant-garde style. The Islington are ideal for the modern man who wants to increase his height up to 4 inches with class and elegance.